Some of you that have known me for awhile know that I grew up playing music. You may not know that I also have a background in the software industry. So, it was just a matter of time before I brought all this together visually in an App. 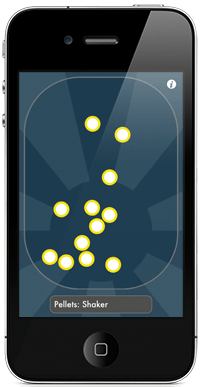 Shakie is an expressive motion controlled percussion instrument for the iPhone and iPod Touch. Pellets create sounds and rhythms as you move and shake them. Shakie's built in pellets include maraca, shakers, tambourine, castanet, bells and spoon. Playing it is simple and natural. And, it's a blast experimenting with it. You may notice some compositional inspiration from my photo series Little Pieces All Together. And of course, you can buy Shakie on the App Store.